The AAT1205 is a multi-input low-dropout Regulator (LDO) specially designed for LAN cards. It provides advanced dual constant output supply 3.3V & 2.5V at the output capable of driving a 400-mA load. The output (OUT25) CAN be disabled by connecting EN25 pin to GND. The AAT1205 is equipped with dual regulated power output for systems with multiple input sources and require dual constant voltage source with a low-dropout voltage. 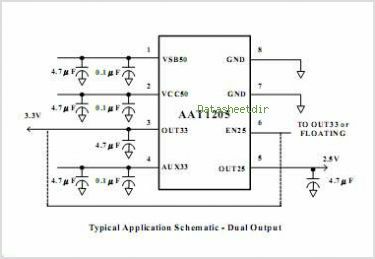 This is an intelligent power source selection device with a low-dropout Regulator for either VCC50 or VSB50 inputs, and a low-resistance bypass Switch for the AUX33 input. By Advanced Analog Technology, Inc. This is one package pinout of AAT1205,If you need more pinouts please download AAT1205's pdf datasheet. 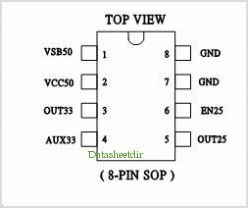 This is one application circuit of AAT1205,If you need more circuits,please download AAT1205's pdf datasheet.